A new Surrey Police headquarters and operational base will be created in Leatherhead following the successful purchase of a site in the town, the Police and Crime Commissioner has announced today. The former Electrical Research Association (ERA) and Cobham Industries site on Cleeve Road has been bought to replace a number of existing sites, including the current HQ at Mount Browne in Guildford, following a detailed search to identify a location in a more central area of Surrey. The new site will become an operational hub housing specialist teams as well as chief officers and senior leadership team, support, corporate functions and training facilities. It will replace the existing Mount Browne HQ and Woking Police Station in addition to replacing Reigate Police Station as the main Eastern divisional base. Neighbourhood Policing Teams will continue to operate from all eleven boroughs including Woking and Reigate. Further sites at Burpham and Godstone where the Roads Policing Team and Tactical Firearms Unit are based will also be moved to the new location. 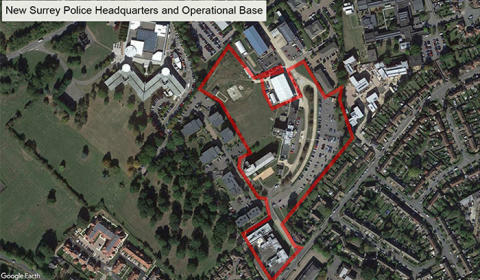 The sale of those five sites will fund a significant proportion of the cost of buying and developing the new Leatherhead base and the Force hopes the new building will be fully operational in around four to five years’ time. The Cleeve Road site, which covers around 10 acres, has cost £20.5m to purchase. The move is part of an extensive estates project to deliver long-term savings by moving out and disposing of some of the current outdated and costly buildings. In their place, an efficient estate will be created that will allow the Force to work in new ways and meet the challenges of modern policing. The new site will also benefit from being a more central location in the county in close proximity to the M25 and the town’s railway station. The new HQ will also provide a central Surrey hub for Roads Policing and Tactical Firearms teams. Guildford and Staines police stations will be retained, accommodating Western and Northern divisional teams. PCC David Munro said: “This is really exciting news and heralds the start of a new chapter in the proud history of Surrey Police. “The search for a new site has been long and complex so I am delighted we have now completed the deal and can start making detailed plans that will shape the future of policing in this county. “The most important factor for me is that we provide value for money and deliver an even better service to the public. We have looked carefully at the budget for the project and even taking into account the inevitable relocation costs involved, I am satisfied this investment will provide savings in the long-term. “A police force’s most valuable asset is of course the officers and staff that work around the clock to keep our county safe and this move will provide them with a much better working environment and support. “Some of our current buildings, including the Mount Browne HQ site, are outdated, poor quality, in the wrong place and expensive to manage and maintain. Mount Browne will remain the Force HQ until the Leatherhead site is fully up and running when it will then be disposed of. It has been at the heart of policing in this county for almost 70 years but we must now look to the future and have a unique opportunity to design a new policing base fit for a modern day police force. “I am well aware of the value Surrey residents place on local policing and I want to reassure people living in Woking and Reigate that our local neighbourhood presence in those communities will not be affected by these plans. Temporary Chief Constable Gavin Stephens said: “A state of the art operational base and HQ will enable us to better meet the challenges of modern policing, allow us to be innovative and ultimately provide an even better policing service for the Surrey public. “Surrey Police has ambitious plans for the future and we’re investing in our people by providing the right training, technology and working environment to meet modern policing challenges. “Our existing sites are expensive to run and restrict the way we work. Over the coming years we’ll provide our teams with workplaces they can be proud of.